CANTON, Mass. – In overtime, the quantity of shots on goal is less important than the quality and Westwood proved that point on Wednesday night against Oliver Ames in a Div. 2 South first round matchup at the Canton Ice House. Despite the Tigers holding a 7-0 edge in shots through the first five minutes of four-on-four hockey, it was the Wolverines’ only shot in OT that proved decisive. Conor Donohue notched his second goal of the game with 47 seconds remaining in overtime to give Westwood a 3-2 win over OA (13-9), completing a comeback from two goals down entering the third period and denying the Tigers another shot at league rival Canton in the next round. Of course, from the Tigers’ perspective, the game should never have gone to overtime anyway. OA scored once in each of the first two periods to hold a 2-0 lead heading to the third, but Westwood wasted no time in cutting that lead in half. Donohue fired a shot from the left circle that beat OA goalie Owen Connor on the glove side inside the first two minutes of the period. The goal turned the momentum and the Tigers did not seem to have the legs to stem the Westwood pressure. Although OA, which beat Westwood 5-2 in the regular season finale, would end up with a 6-5 edge in shots for the period, the Wolverines had loads of offensive zone time and the much better chances. Donohue nearly added a second three minutes after his first but Connor made the save and Shane Cronin missed a golden chance to tie it right on the edge of the crease. Max Ward had the best chance of the third period for OA but he was unable to get his stick on a rebound off a save by Justin Anderson (33 saves). A minute later, Mark Horsfall slid to his right along the blue line, picking the right angle to fire a wrister through traffic that went in off the post to tie the game with 2:46 left. 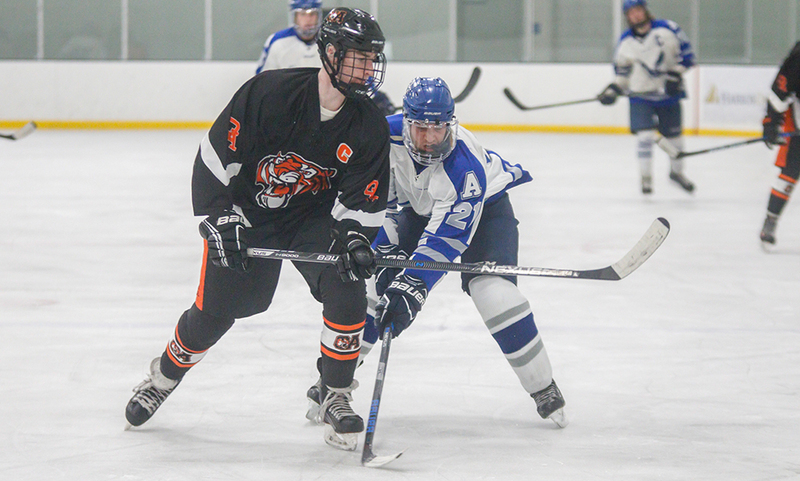 Despite struggling through the third, OA looked suddenly refreshed after a quick break before the start of overtime and the Tigers came out flying in the four-on-four. Brett Williams, Rory Madden, and Eric LeBlanc all put shots on goal and the Wolverines were on their heels for the first five minutes. That was until a pass through the middle caught the OA defensemen pushing forward and allowed Donohue to find space in the left circle. His snap shot beat Connor to the far post and set off a raucous celebration. The Tigers had started the game well. Huter Costello had the game’s first notable scoring opportunity five minutes in but his shot was kicked aside. Colin Bourne nearly opened the scoring with a shorthanded breakaway but Anderson managed to get a stick check in and the puck rolled to the corner. It looked like Westwood had gotten on the board when Brian Reissfelder went bar down from the slot, but the puck was ruled to have not crossed the line. Neither team stopped skating, although there were questions raised from the Wolverines bench. Only two minutes later, freshman Ross Carroll put the Tigers in front with an inch-perfect backhand tip over the shoulder of Anderson from a Matt McCormack pass out of the left corner. In the second period, defenseman Adam Healey made it 2-0 for the Tigers when his shot from the point made its way through a sea of bodies in front of goal. Seconds later, OA could have broken the game open with another chance, but a scrum in front led to a prone goalie and a puck that slipped narrowly wide of the post. Williams had a good look from the slot after a drop pass by Bourne, but he could not find the corner and Anderson blocked it aside. The missed opportunities during a period in which the Tigers had a 13-5 edge in shots would come back to haunt the No. 10 seed. Westwood finished the second with a quick flurry and then turned the game on its head in the third. Canton, 3 vs. Coyle & Cassidy, 2 – Final – Click here for a Recap and Photo Gallery from this game. Franklin, 3 vs. Marshfield, 2 – Final (OT) – Brendan O’Rielly scored the overtime winner to hand Franklin the Melchiono Tournament title. Jeremy Miller and Scott Elliott also scored in the win, which will be recorded as a tie for MIAA purposes. 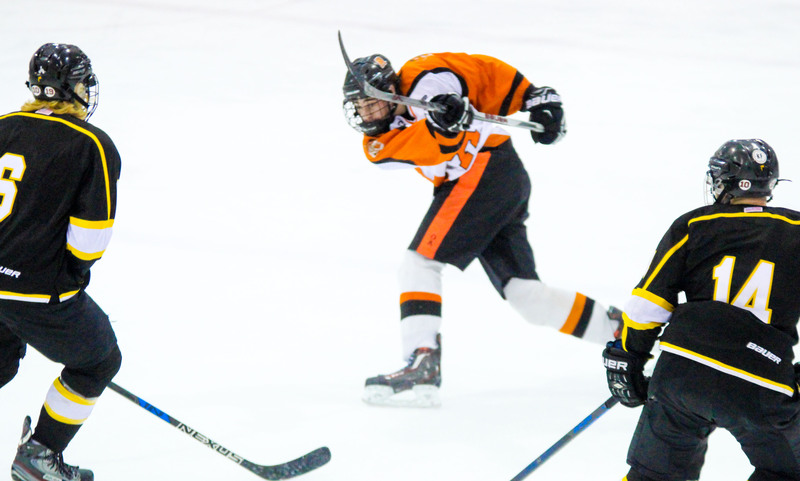 Oliver Ames, 5 vs. Westwood, 2 – Final – Oliver Ames overcame a 2-0 deficit after a period of play with five unanswered goals to beat the Wolverines. Senior Rory Madden scored the first two goals to tie the game with freshman Ross Carroll and junior Adam Lyons earning assists on both goals. Junior Max Ward put OA ahead on the power play with Brett Williams assisting. Madden set up junior Matt McCormack for the fourth goal and Carroll sealed the game with an empty net goal. OA coach Sean Bertoni noted sophomore goalie Owen Connor had a strong performance in net. Foxboro, 54 @ Hopkinton, 55 – Final – The Warriors ended up with a split of the season series against Div. 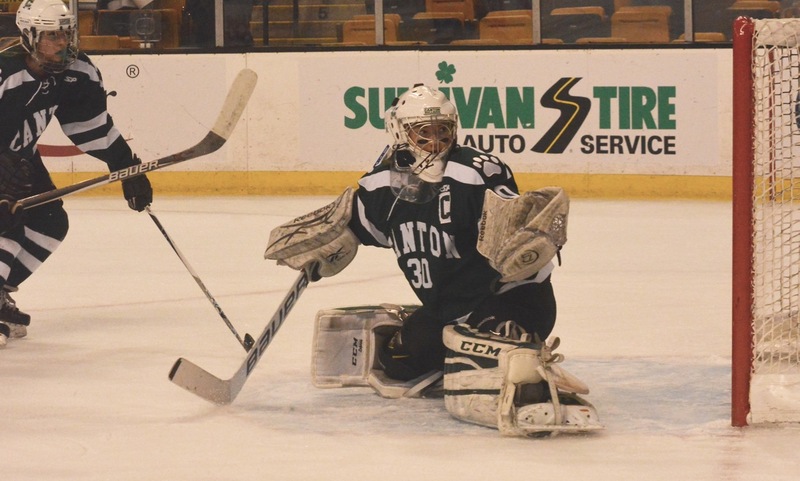 2 contender Hopkinton and remain a win away from clinching a playoff spot. Foxboro was led by Lily Sykes with 17 points. Canton, 5 @ North Attleboro, 0 – Final – Click here for a recap of this game. Foxboro, 5 @ Bellingham, 5 – Final – Foxboro’s Josh Bertumen and Sam Garrabrant each scored a pair of goals for the Warriors while Brendan Tully notched one goal and two helpers. 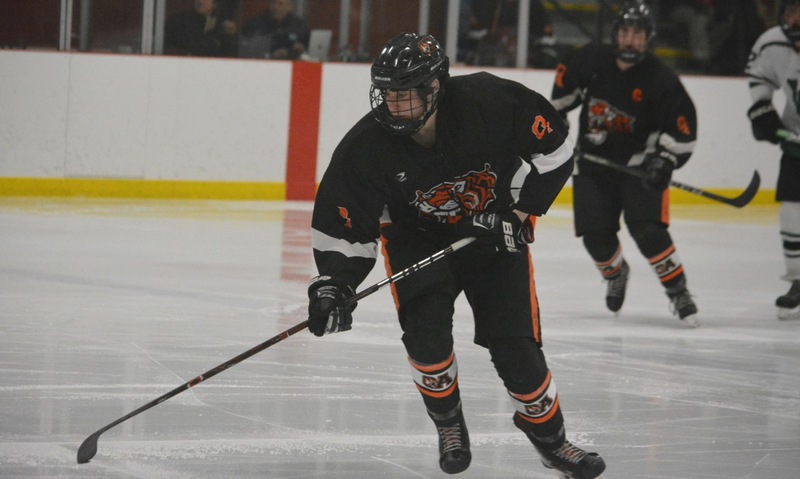 Oliver Ames, 3 @ Wellesley, 2 – Final – Oliver Ames picked up a huge upset on the road, handing Wellesley its first loss of the season. The Raiders entered the game 8-0-3 and as one of D1 South’s top teams, allowing just nine goals. OA opened the scoring with a goal in the second period but fell behind 2-1 entering the third period. The Tigers then scored with 8:13 left to tie the game and netted the winner with just 1:45 to play. Junior Max Ward scored the game-winner on an assist from Rory Madden, and also scored OA’s first goal. Junior Brett Williams tied the game for the Tigers in the third. 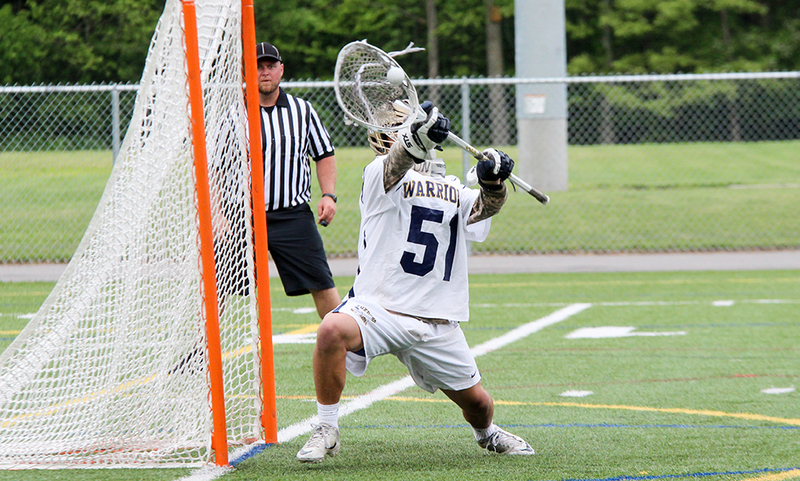 Head coach Sean Bertoni said sophomore Owen Connor played great in goal with 29 saves. BOURNE, Mass. – Each goal is worth the same but there’s no denying that getting one at the right time can make it feel worth even more. Oliver Ames not only found the back of the net often, but scored at those important times as well, cruising to a 5-2 win over ninth-seeded Nauset. The Tigers, seeded eighth, got its first goal less than three minutes into the game to set the tone. OA added its second less than two minutes after Nauset tied the game, scored its third on the power play, its fourth less than a minute after its third and the final goal under two minutes after Nauset cut the deficit to two. Oliver Ames set the tone with its very first shot of the game. 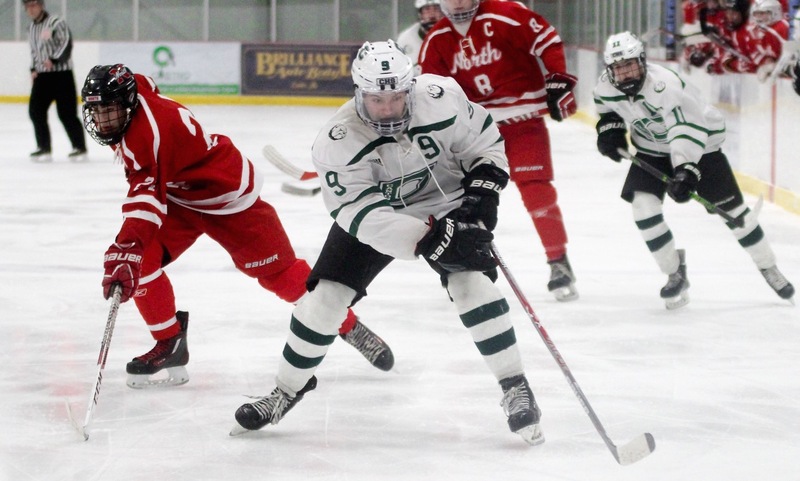 Senior Jack Maloney found Brett Williams on a breakout pass and the sophomore skated to the center of the ice and unleashed a slap shot between a pair of defensemen that found the back of the net. Oliver Ames led just 2:31 into the contest. Nauset leveled the game just over midway through the period, taking advantage of a one-on-one opportunity. Nauset’s Devin Roderick went into the offensive zone with just one defenseman in his way and was able to slide the puck just inside the post to tie the game. But in the all important next couple of minutes, Oliver Ames went back up. Sophomore Cullen Gallagher collected a loose puck in the offensive zone, and with no pressure on his back, turned and fired a puck towards goal. With junior Rory Madden providing a screen in front, the puck went straight in. Just 1:42 after the Warriors tied the game, Oliver Ames took the lead back. While Oliver Ames had two goals, Nauset brought a very physical approach to the game. Although that might have swayed other opponents, Oliver Ames has experience in that situation. Oliver Ames once again came up with a timely goal, scoring the all important next goal less than three minutes into the second period. Just 89 seconds into the second period, the Warriors were whistled for interference to put the Tigers on the power play. OA passed the puck around the offensive zone before junior forward Eric LeBlanc – patrolling the blue line during the power play – stepped into a wrist shot that found its way through traffic and into the back of the net. And less than a minute after that, the Tigers tacked on another goal. With the majority of players on the left side, a cross ice pass found junior Michael Nikiciuk along breaking into the offensive zone. With an odd-man rush, Nikiciuk centered his pass for an easy one time tap in from Madden to make it 4-1 with 11:29 to play in the second period. “We changed our personnel on the player play for the last couple of games so it was good to see shots from the point,” Bertoni said. “We’re not the most skilled team but when we get shots from the point, good things happen…we love garbage goals. We want to get traffic out in front and we had two of those tonight. The Tigers took a penalty while on the power play to make it 4-on-4 and the Warriors were able to capitalize. As Oliver Ames’ defense inched forward, a turnover led to Nauset racing into the attacking zone. After beating one man, Nauset’s Nick Hull went in alone and tucked the puck in to make it 4-2. But as they had done all game, Oliver Ames had a timely answer. Just 90 seconds later, Oliver Ames once again cashed in from a shot from distance. Sophomore Matt McCormack took a pass from classmate Collin Bourne and fired a wrist shot from just inside the blue line that found the back of the net. Oliver Ames had a 24-14 lead advantage in shots. The Tigers (14-6-1) await the winner of #1 Scituate and #16 Dedham on Wednesday. Oliver Ames hockey will play the winner at Gallo Arena in Bourne on Saturday at 12:30.